These crazy spaghetti squashes, have you seen these things? You're not actually going to trick anyone into thinking they're eating pasta with this, so don't try. I didn't even bother trying to pass this off as actual spaghetti with R, who is always a little incredulous about the all-veggie meal. But, I really didn't have to either. This dish was so good, fresh and bright tasting, not to mention healthy. But the kind of healthy that makes you feel well-fed, not deprived. 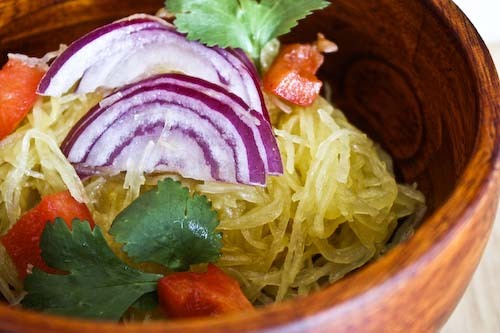 Boiling is not really the way to go with spaghetti squash, it kind of waters the vegetable down, which is not something you want. In Uncommon Fruits and Vegetables: A Commonsense Guide, Elizabeth Schneider gives several alternative methods for cooking your squash, from steaming to boiling to baking. I chose the latter technique in preparation for this recipe, which is adopted from the same book. The easiest, requiring only a few pricks of the fork? Baking, for sure. Just like baking a potato, you want to make a few small holes in the skin of the squash so it doesn't burst, then roast it in an oven preheated to 350 (or even 375 depending on if you're using your oven for other things as well). It should take about an hour. Once done, remove the squash and cut it in half right away so it doesn't continue to bake on the inside. You can let it cool for a moment, then scrape out the seeds. 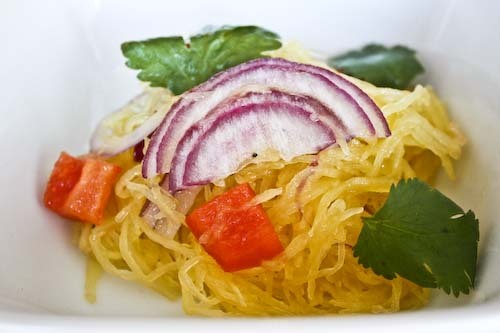 Using a fork, scrape out the strands of spaghetti squash into a colander. Toss the strands with 3/4 teaspoon salt and let the squash drain while it cools completely. Mix the salt, pepper, vinegar and garlic together, then whisk in the oil. Toss with the squash, onion, pepper and parsley. Chill, covered. Just before serving, add the tomatoes. You may have noticed that there are no tomatoes in my pictures. I forgot to add them before we were halfway threw our plate-fulls, at which time everything was dumped back into the bowl and the tomatoes were added. I would never purposefully skip a tomato. You know, this is one vegetable I have not mastered (there are, of course, others...) I feel like every time I have tried to make it, it cooks unevenly and so some of it is mush and some of it is raw. I will try your method - especially the part about cutting it right open after baking. I hadn't thought of that. My husband loves spaghetti squash! I simply bake it and serve with some butter, salt and pepper. Your recipe is so much more interesting and looks great too! I absolutely agree...baked, not boiled, Mr. Bond. Thought I love it with a homemade marinara, I never thought of trying to substitute it for spaghetti. Whole different animal. This time of year, I love the flavor of a spaghetti squash well and thoroughly baked with a generous amount of olive oil, fresh garlic, salt and cracked pepper. 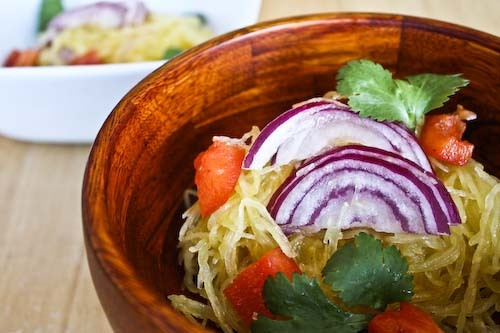 I have never seen/heard of a spaghetti squash... is there any chance of seeing a photo of it before it was cooked? 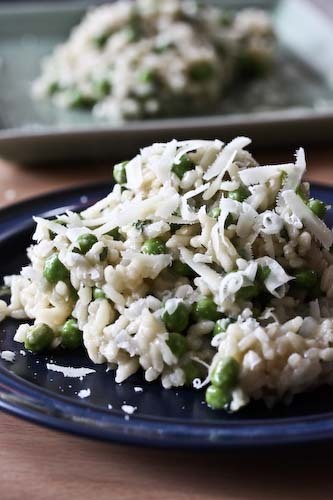 Thanks for posting the recipe - I love finding new and interesting things on peoples blogs! Dana, definitely try roasting, worked like a charm! Snooky doodle, thanks! but it doesn't hold a candle to your sweet treats! Veggie Belly, I'll try it with some butter next time to really let the squash come through! Qiuqiu's parents, I definitely want to try it with marinara next time! Yum!! Miss Marie, it's a unique little veggie isn't it? Annie, unfortunately I didn't remember to snap a photo before baking, but I'll do it next time. It's a pretty nondescript vegetable, though, I have to say! Its good taste,i love this menu.